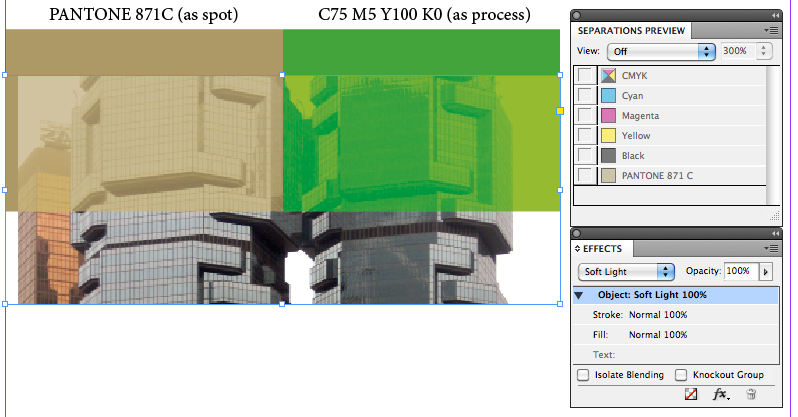 “Spot” the difference of soft light with overprint preview | Colecandoo! ← The proof is in… your email? I recently found myself being the “bad guy” after having to instruct a customer to resupply their artwork given that many of the effects applied to the pictures in InDesign would not print as desired. In short, the artwork was an annual report printed in full colour plus a metallic silver spot colour. Originally supplied PDF only, everything looked fine on first glance with the overprint preview off. However, while the document was being manually preflighted using Acrobat’s Output Preview, I had noticed that a greyscale-like effect on the silver had disappeared once I had entered the Output Preview. Concerned, I restarted Acrobat to make sure the glitch was not software related, but again the same thing appeared. This happened on several machines and it soon became apparent that the artwork would in fact print as it appeared in Output Preview rather than the normal preview. The customer was then contacted and informed of the situation. After replying that the artwork looked fine on his screen, the customer was then instructed to turn the overprint preview on within InDesign, and lo and behold… he began to see what I saw. He then told me he had used the soft light effect. To demonstrate the phenomenon, I have created a new InDesign file with five elements: a rectangle coloured with Pantone 871C; a rectangle coloured with the default green which ships with InDesign; a stock photo with the soft light effect applied , and two captions of the colours in the rectangles. In the before image, the Separations preview is turned off. 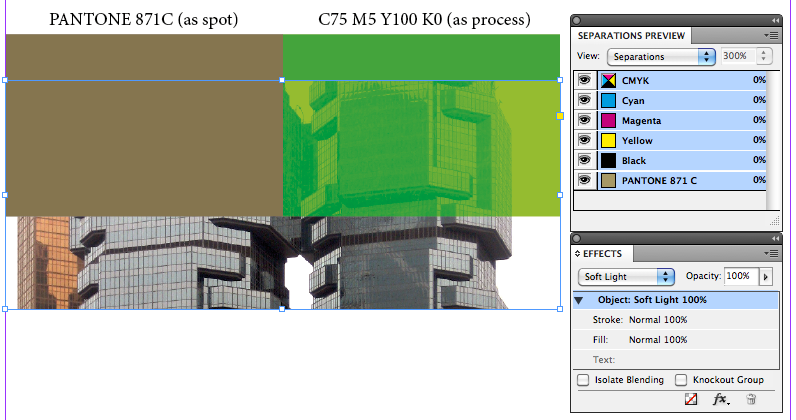 resulting in the image disappearing from Pantone 871C rectangle. However, the image still appears over the process green rectangle. Ultimately, this means that the effect is only reproducable over process colour, and not spot colour, regardless whether it is metallic or not. Interestingly as well was the fact that in Live preflight, there was no error warning of this particular feature of the soft light effect, so if I was purely to obey the live preflight and not check my file with the separations preview or overprint preview, this would have been completely missed. The lesson here? Always check artwork using the separations preview to make sure the artwork will appear as designed, and that some effects will work in process only. Interesting it doesn’t call out the Soft Light blend mode! BTW, two things about Overprint Preview. First, in InDesign, you don’t need to open the Separations Preview (if it isn’t already open). You can toggle OP on and off with a keyboard shortcut, or toggle it from the View menu (it’s the first item). Second, I *thought* that OP is turned on by default — it’s the default view mode — in Acrobat 9 and X. If not, you can make it so in Acro’s preferences.